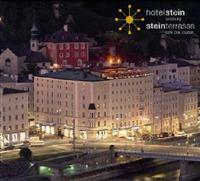 The Stein Hotel Salzburg is a Salzburg hotel located in the heart of the city center on the banks of the River Salzach. Mozart's birthplace is located a mere two hundred meters away. Other places of interest are well within walking distance, including the Mirabell Castle and Gardens, the Hohensalzburg Fortress, the Salzburg Cathedral, and the Rupertinum Modern Art Gallery. The Salzburg airport is a short drive from the Stein Hotel Salzburg. Public trains and buses are plentiful, and taxi services are easily arranged. Most places of interest in Salzburg are within walking distance from the hotel. Each of the Stein Hotel Salzburg's fifty-four guest rooms offers marble appointed en suite baths with hair dryers and complimentary toiletries. All rooms have a flat screen satellite television, direct-dial phones, and safes. 24-hour room service is available. This four-star hotel is housed in a fourteenth century building, but offers modern décor and amenities. The Stein Hotel Salzburg has a rooftop terrace and bar, a café, and a 24-hour concierge. Business travelers may avail themselves of the high-speed Internet and conference rooms. Childcare and off-site parking may be arranged for a fee.